For death defying leaps through the forest canopy no primate can compare with the fearless langur. The dusty langur, or leaf monkey as it is commonly called, is a canopy dweller which in habits both lowland and high karsts forests. The exclusive diet of leaves of this species allows it to maintain much smaller territories than the gibbon which requires 30-50 square kilometers to find sufficient fruits. 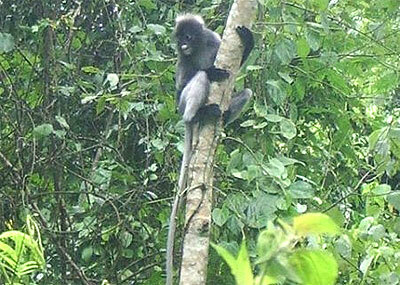 Like the gibbon, the langur abhors water and will cross no body of it, river, lake,stream or sea shore. The Dusky langur has a face that can only be described as adorable. White rings around the eyes add emphasis to their already large size while a cream colored upper and lower lip area resemble the markings on a child stuffed toy. The langur is distinguished by soft, dusky grey fur and a tail longer than the body. Unlike New World monkeys with their prehensile tails, the langur’s tail can not wrap around or grasp branches. While feeding, the tail of leaf monkeys hang limply and resemble little more than dangling liana vine hanging from the branches upon which the primates graze. Only in fight does the exceptionally long tail seem to serve purpose; it acts as a counter balance when the langur do their heart-stopping falls to lower branches, and it appear to cushion the blow upon landing. The Dusky langur is found in south Thailand at the northern limit of its range. It will graze for long period con-cealed in the foliage of a single branch so it is difficult to view unless spotted in a profile on a free sprouting new leaves. Most people spot only langur s when they hurl their bodies through poen space to escape humans viewing them. Hunted and persecuted throughout their range for meat and as pets, the Dusky langur face an uncertain future. It is common for baby langurs to die once they are weaned from milk in captivity. In the wild the mother chews leaves to wean her young off of milk and the enzymes necessary for digesting leaves in the gut are passed to the offspring through the mother saliva. Human caretakers are incapable of this so pet langurs usually perish.